In November 2018, the Lahore Biennale Foundation named Hoor Al Qasimi, President and Director of Sharjah Art Foundation, UAE as curator for the second edition of the Lahore Biennale, slated to be held in early 2020. This move signals the Foundation’s interest in extending its regional scope towards West Asia and the Middle East. Held in March 2018, the inaugural Lahore Biennale (LB01) was invested in situating itself in the region’s critical discourse on contemporary art and saw the participation of artists and academics from Bangladesh, India, and Sri Lanka, among other locations. Lahore Biennale 01 was a fourteen-day event that showcased over 100 artworks across seven major venues in Lahore, making it an unprecedented event that engaged diverse audiences aesthetically and intellectually while garnering popular support. Local artists and audiences are familiar with the programming of the Lahore Biennale Foundation, that throughout its four-year history under the leadership of Executive Director, Qudsia Rahim has conducted public programming at various public avenues in Lahore, including at local parks, bookstores, cafes, and other conventional and non-conventional exhibition venues. The events Lahore Biennale Foundation has produced have taken the shape of exhibitions, conversations, discussion groups and artist performances. These have included participation by artists, architects and other creative practitioners such as Atif Khan, Imrana Tiwana, Waqar Aziz, Farida Batool, Malcolm Hutcheson, Ayesha Jatoi, Risham Syed and Attiq Ahmed to name a few. Distinguished invited international speakers and workshop leaders, such as Natasha Ginwala (Berlin), Paul Keller (Amsterdam), Asma Mahmood (Toronto) and Omar Nagatti (Egypt) have contributed to training and skills development in Lahore by engaging with participants and audiences in various capacities. The Foundation has developed longstanding initiatives such as artSPEAK, a series designed to spark dialogues on issues of interest relevant to the visual arts, and which support the highly public mandate of the organization. Since 2015, the work of the Foundation has evolved. Board members of the organization first came together to work upon a shared vision, which saw the organization launch one-off projects such as with Atif Khan’s public art installation, City Within a City at Istanbul Chowk, in 2015. 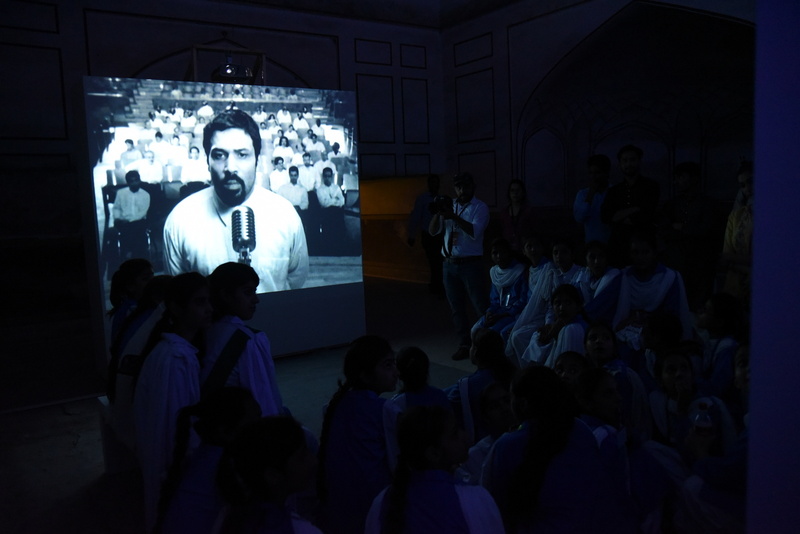 The 56th Venice Biennale Collateral project, The Viewing, The Viewer and The Viewed at Liberty Market and its affiliated program of workshops, symposia and the site-specific Gandi Engine Comission by the Tentative Collective, in 2016 Matt Kushan and Unum Babar’s project with the Scottish organization Pidgin Perfect at Bagh-e-Jinnah took the shape of multiple permanent installations, both aesthetically pleasing and purpose-built for the functional enjoyment of park-goers.In late 2016, the Foundation in collaboration with major international partners including the Goethe Institut and The Danish Centre for Culture and Development conducted a symposium, City in Context on the topic of urban life where sessions and panels gave voice to discussions around issues related to the urban, and artistic solutions or impediments as experienced in major cities in the world. City in Context also provided a platform to showcase compilations of contemporary oral stories, musical performances, lecture performances and exhibitions. 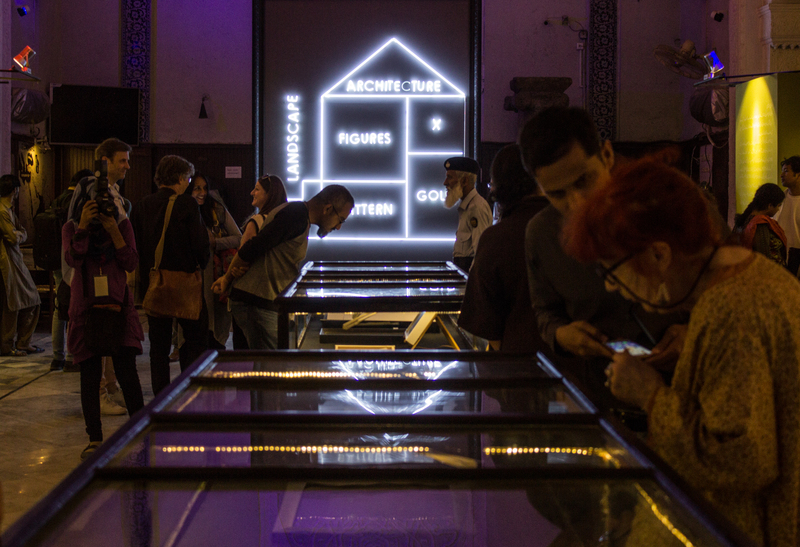 These multi-partner and multi-component events continued to feed into the ethos of Lahore Biennale 01 (LB01) in 2018. In LB01, various elements that made sense for the city of Lahore came together, paying homage to the various layers of urban history, as well as to the diversity of people and experiences of the city. LB01 grew organically, always keeping in view its relevance to our context in Pakistan. The Lahore Biennale 01 organizational team was cognizant of Lahore’s context in their programming, choice of artists represented as well as the use of bilingual materials for publication and press. With its numerous educational and cultural institutions, Lahore has produced some of the most internationally acclaimed artists of the region. However, what was often lacking in Lahore, and to a larger extent in Pakistan, is that local artists rarely had the opportunity to view and engage with the works of their counterparts from the city, the nation, and the region in public settings. Having the biennale in Lahore meant our biennale was able to accomplish that at a larger scale, and extend this engagement to more diverse publics within the city, and regionally. As had been the strategy of the Foundation since 2014, by creating programming around topics, or art works, audiences found ways to enter into sensory or intellectual experiences on their own terms, not always needing a specialized rhetoric of art. This is a truly unique aspect of the programming of the Foundation, for it has allowed us to cultivate new audiences, as well to begin articulating in new ways on concepts around “art,” “activism,” “public spaces,” “gendered spaces,” “accessibility” and many other relevant issues, thus opening up these dialogues in the very same milieu that existed prior to the Foundation’s founding but where such conversations on these issues did not take place at such scale. One could also go so far as to say that some of the vacuum created by dwindling establishments of Lahore’s cultural and literary communities such as with Pak Tea House, LBF has facilitated avenues and spaces where local audiences engaged in the creative realm may find new ways to gather and debate. These are the results of commitment and engagement that has of course very much been bolstered through the participation of the artist communities of the city. In the same vein of opportunity creation and in the spirit of giving back, the Research Unit at LBF was launched in Summer 2018. The Research Unit also complements that programming of the Academic Forum at LB01, a fourteen-day program of academic talks and workshops, curated by Dr. Iftikhar Dadi of Cornell University, that saw the participation of major international scholars working on visual cultures of the Global South. In Fall 2018, LBF awarded four research grants to Pakistani junior scholars who began conducting primary research on modern and contemporary arts and visual culture of Pakistan. Initiating research will further develop an ecosystem geared to thinking critically and academically on areas relevant to the region. In this regard too, LBF has been a trailblazer, initially setting up the first research grant in 2015 that enabled scholarship on late modernist artist Zubeida Agha, which has been successfully archived with the Hong Kong based organization, Asia Art Archive, and is searchable online. The hopes for LB02 are to further create and sustain dialogues promoted during the past four years since the organization’s inception, as well, to expand upon these discussions keeping in mind the larger MENASA (Middle East, North Africa and South Asia) region. The Sharjah Art Foundation has already maintained collaborative ties with the Lahore Biennale Foundation at the time of LB01, and has previously supported the work of artists of Pakistani background, including Basir Mahmood, Shahzia Sikander, Imran Qureshi, and Rasheed Araeen. Under the curatorship of Hoor Al Qasimi, LB02 hopes to bring a new vitality into the artistic landscape of Lahore, and to Pakistan at large.